Are you there? Send your images, video to iReport. 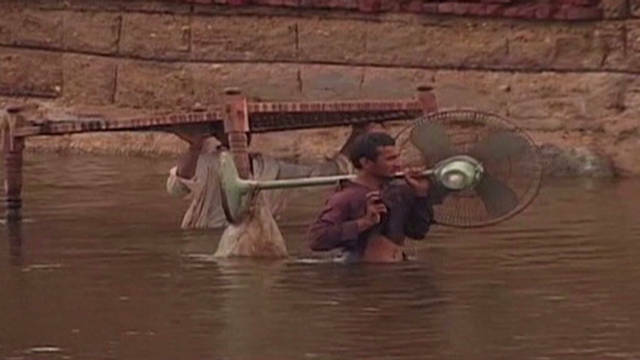 Islamabad, Pakistan (CNN) -- Heavy rains and flooding in Pakistan's southeastern Sindh province have killed some 226 people over the past month, the National Disaster Management Authority said Tuesday. The dead include 34 children and 59 women, said an agency summary. In all, 5.3 million people have been affected by the flooding, and 1.19 million homes have been damaged, the authority said. The flooding has inundated more than 4.5 million acres and damaged an estimated 80% of crops. And the heavy rains are not over. "Meteorological conditions indicate that a strong weather system is developing over central parts of India that would cause widespread heavy rains in Pakistan during the coming week," said a weather advisory posted on the disaster agency's web site. "Heavy to very heavy rainfall may generate severe flooding in lower Sindh," as well as flash flooding in Punjab, Khyber Pakhtunkwa and Balochistan provinces, the advisory said. The United Nations was making arrangements to provide food supplies to half a million people for the next month in Sindh, and it was also set to supply 20,000 tents this week, the state-run Associated Press of Pakistan reported Monday. A U.N. team was visiting Pakistan in response to a phone conversation between Pakistani President Asif Ali Zardari and U.N. Secretary-General Ban Ki-moon, the news agency reported. Aid is also flowing in from other countries. On Monday, the Chinese ambassador to Pakistan presented a $50,000 check to the National Disaster Management Authority and has also promised $4.7 million in aid to flooded areas as well as tents, the authority said on its web site. Also, the interior minister of Iran, Mostafa Mohammad Najar, said Sunday Iran will donate $100 million in aid to Sindh, the Associated Press of Pakistan said. Najar said he will take a planeload of relief goods to Pakistan within a week. And Pakistan's Finance Division has established a Prime Minister's Relief Fund for flood victims in Sindh and elsewhere, according to the Associated Press of Pakistan. Donations can be made by domestic and international donors, according to the report. CNN's Nasir Habib and Aliza Kassim contributed to this report.